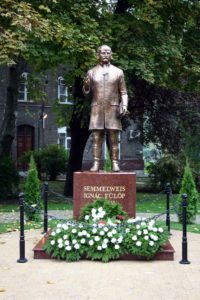 Ignác Fülöp Semmelweis was born on July 1, 1818 in the Meindl House (Apród utca 1-3), in Buda. He was the fifth child among ten children in the family. 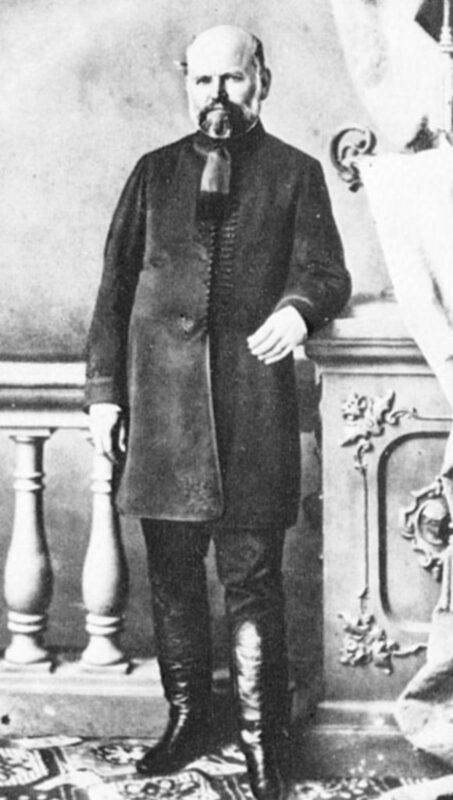 His father, József Semmelweis, was a grocer of Hintz origin, while his mother, Terézia Müller, was a Schwab. In 1823, the family moved to Apród utca 6, where József Semmelweis continued to run his grocer’s shop, Fehér Elefánt [White Elephant]. Semmelweis started his studies in 1829 at the Roman Catholic University School, located in the Buda Castle area. He also attended the Cistercian Szent István Secondary School in Székesfehérvár. Following his graduation from secondary school in 1835, Semmelweis enrolled in a two-year Arts programme at the University of Pest. Obeying his father’s wishes, he applied for the University of Vienna’s Faculty of Law in 1837, but ended up transferring to the Medical Faculty that very same year. 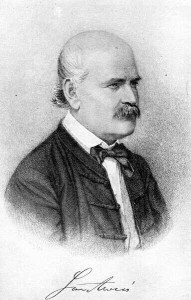 Semmelweis moved back to Pest-Buda (now Budapest) the following year, continuing his studies at the University of Pest’s Medical Faculty. In 1840, Ignác Semmelweis returned to the University of Vienna once again, where he earned his Doctor of Medicine degree in 1844 with his botanically-themed dissertation, entitled Tractatus de Vita Plantarum. That same year, Ignác Semmelweis earned Master Obstetrician certificate, and Master Surgeon certificate in 1945. Following his graduation, Semmelweis continued to attend Josef Skoda’s lectures on internal medicine, and Karl von Rokitansky’s autopsy practice and pathology lectures. 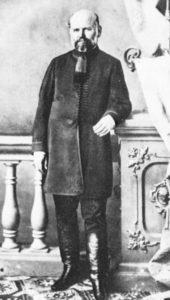 He successfully applied for an assistant professorship at Professor Johann Klein’s Obstetrics Clinic in the Allgemeines Krankenhaus [Vienna General Hospital] in 1846. A few months later, Franz Breit – whose position Ignác Semmelweis had filled – returned, and so Semmelweis lost his job. Semmelweis took English lessons and considered moving to Dublin, Ireland. In 1847, however, Breit was promoted as head of the University of Tübingen’s obstetrics department, and so Semmelweis’s position was reinstated. In March 1847, he travelled to Venice on vacation, during which time his good friend Jakob Kolletschka, a professor of forensic medicine, died in Vienna. 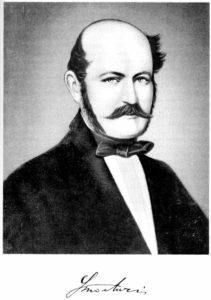 Following his return, Semmelweis examined Kolletschka’s autopsy report, and discovered that the disease which had caused his death and that, which was known as childbed (or, puerperal) fever, were one and the same. Semmelweis came to the realisation that it was the doctors themselves who caused childbed fever by not disinfecting their hands between performing autopsies and examining expectant women in the maternity ward. It became clear to him that this was the explanation behind the fact that childbed fever was a much rarer phenomenon among pregnant women treated exclusively by midwives and midwives-in training than among those also treated by doctors and medical students. After trying several chemicals, Semmelweis finally settled on chlorinated lime in the spring of 1847 as his disinfectant of choice. He ordered all doctors, medical students, and nurses to wash their hands with the chlorinated lime solution before entering the maternity wards and, in October, made hand washing between examining patients mandatory, as well. His views were very unpopular and his colleagues did not take the results seriously, even though the mortality rate of childbed fever among women treated by doctors fell below that of women cared for by midwives. In the spring of 1848, Semmelweis joined the revolutionary National Guard in Vienna. His assistant professorship at the Allgemeines Krankenhaus expired on March 20, 1849. He had requested a privat-docentship in February of that year, asking that he be allowed to demonstrate on cadavers and phantoms. On March 15, 1850, he gave a talk on childbed fever to the Association of Physicians in Vienna, but his views were rejected by the university. In May, he requested privat-docenship once again, this time agreeing to only use dummies in his teaching until the “resolution of the cadaver issue”. On October 10, Semmelweis was appointed privat-docent, with the condition that he must use dummies in his demonstrations and practices. Five days later, he left Vienna unexpectedly, returning to Pest. In 1851, he took over Rókus Hospital’s maternity ward as honorary head physician. He received some leadership privileges, which caused revulsion among his fellow colleagues. He was appointed Professor of Theoretical and Practical Obstetrics at the University of Pest in 1855, but in the meantime he was also working for Rókus Hospital for two more years. Semmelweis spent six years as the head of Rókus Hospital’s maternity ward, during which time the mortality rate from childbed fever at the hospital dropped to 0.85 percent. Meanwhile, the office of the director of the obstetrics department in Vienna became vacant with the death of Klein in 1855, but Semmelweis was not nominated for the position. Two years later, the University of Zurich offered him a position as professor, but he turned down the invitation. Ignác Semmelweis married Mária Weidenhoffer in 1857. They had a total of five children, though only three survived into adulthood, and only one left descendants. 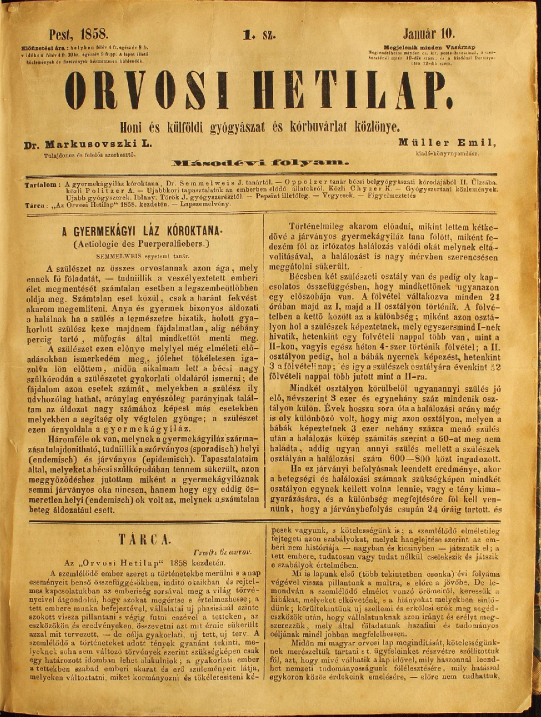 With the encouragement of his friends, especially Lajos Markusovszky, Semmelweis first published his discovery and results about aseptic procedure only years later, in 1858, in Orvosi Hetilap [Medical Weekly]. 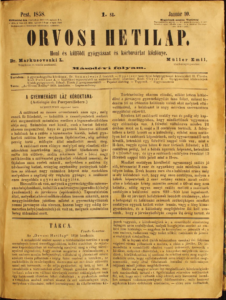 This periodical was edited by Lajos Markusovszky. In 1860, Semmelweis published a book in German, entitled Die Aetiologie, der Begriff und die Prophylaxis des Kindbettfieber [The Etiology, Concept and Prophylaxis of Childbed Fever]. This was followed by his first and second open letters written to colleagues, also published in German in 1861 and 1862, respectively. 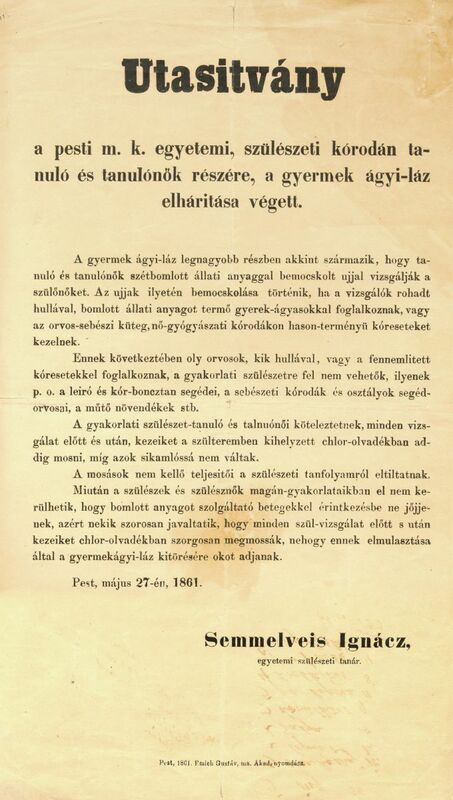 Due to his new ideas and his passionate tone his views were rejected and attacked by the majority of Hungarian doctors and doctors from abroad as well. He regularly published in Orvosi Hetilap [Medical Weekly], he was editor of the coloumn in obstetrics and paediatrics, then he also became editor of the section Gynecology and Paediatrics in Orvosi Hetilap [Medical Weekly]. Because of the fact the he did not manage to convince his fellow colleagues about his views, he shifted the emphasis on the professional development of young doctors. It was among his plans to publish a coursebook about obstetrics and gynecology. Years before his death Semmelweis’s behaviour started to become unusual. Because of the constant attacks and the serious self-accusation after his discovery about the childbed fever he started to have serious problems with his nervous system, which ended up in a mental illness in July 1865. Semmelweis’s wife turned to Professor Hebra for help, who was their friend in Vienna. With his intervention Semmelweis was admitted to the Viennese Mental Hospital in Döbling on July 31. Semmelweis passed away thirteen days later, on August 13. The circumstances about his death have been the subject of scientific debates for decades. The following possible reasons emerged that could have caused his death: an infection (syphilosis) that he caught during an autopsy at the beginning of his medical career; paralysis progressiva that evolved after this infection; as well as a brutal abuse by the staff that he had to suffer at the mental hospital in Döbling. According to the autopsy report and a pathological and radiological examination performed on Semmelweis’s bones in 1963-1964, the cause of death was sepsis resulting from a subacute osteomyelitis on his right hand. Ironically then, he died of the same disease he himself had described. Ignác Semmelweis is notable not only as an obstetrician, but for his work as a surgeon as well. Indeed, he performed the first ovarian surgery and the second Caesarean section in Hungary. His wife brought his ashes back to Budapest from Vienna in 1891, laying him to rest in the family crypt. Ignác Semmelweis found his final resting place in 1965, when his ashes were moved to the courtyard of his birth house, which currently houses the Semmelweis Museum of Medical History. 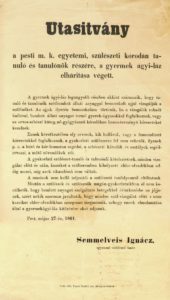 A collection of Ignác Semmelweis’s printed materials on his discoveries related to childbed fever (1847-1861) was inscribed in UNESCO’s Memory of the World Register in 2013.